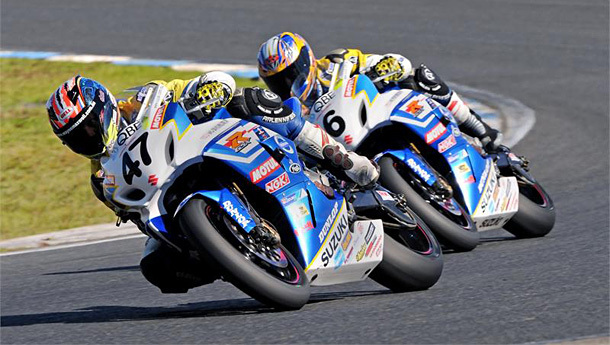 After nine years in the premier QBE Australian Superbike class, Team Suzuki rider Wayne Maxwell (above) has taken his first championship crown with a new national best lap-time of 1:32.274 around the scenic 4.445-kilometre circuit, before clinching the title in Sunday’s opening 12-lap affair with a 0.014s victory. CAT Yamaha rider Daniel Falzon took the title in the Motul Supersport class, capping off an incredible debut year for the 19 year old, in which he finished on the podium at every round. Maxwell, who started from pole position, won the opening 12-lap race but the Race 2 win and round spoils went to NextGen Motorports Glenn Allerton. Maxwell, competing with the number one plate, claimed a fighting third position in mixed conditions to seal the runner-up overall for the round. Wayne Maxwell and Robbie Bugden. Wayne Maxwell: “It is a great feeling to get my first Superbike title. It is also really rewarding to finish the championship with a podium results. “I always knew I could win, it was a matter of everything falling into place. Roll on 2014. “I didn’t start the season strong, but certainly gained momentum mid-season and it’s a credit to all of Team Suzuki,” Maxwell reflected. “It was awesome to do the fastest-ever Australian Superbike lap around here in qualifying; and then to clinch the championship with victory in race one was a dream result. Allerton’s round win saw him surpass Team Volvo Suzuki’s Robbie Bugden in the championship standings to take the runner-up spot. “It was very satisfying to end the year with such a good results,” Allerton said. “I finished second in Race 1 but it was as good as a win, it was that close between Wayne and I. “It was nervous times before the last race due to the rain but I decided to go with slicks. Once I got past the guys on the wets it was about managing the gap. “While we had hoped to finish one better in the championship it is still a great achievement for our team as we are not a factory team,” Allerton added. Team Volvo Group Suzuki’s Robbie Bugden was also in top form at Phillip Island, qualifying third and rounding-out the top three in a thrilling first race. 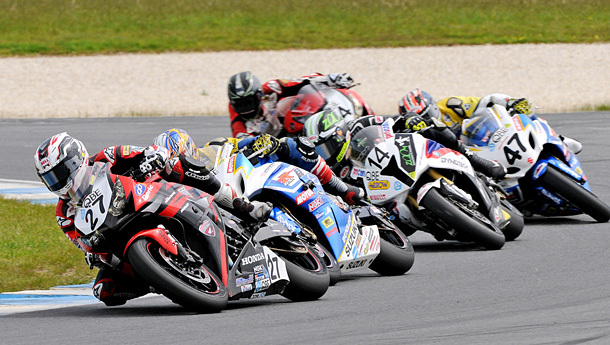 Second in race two cemented the five-time New Zealand Superbike Champion third overall for the round and championship. Robbie Bugden: “It was a bit of a tough round, but we had a cracker race in that first race. That second race was a bit of a gamble; it was in terrible conditions. Overall in 2013 it’s been a great year. For Team Suzuki, we have been the only two riders who have been on the podium at every round, so it’s a credit to the team at Suzuki. Jamie Stauffer got a very good start off the line in Race 1 and spent much of the race battling hard for first place. Leading many times during the race, the Honda rider looked strong for victory, however it was not meant to be as his grip levels fell, Stauffer could not hold strong and finished the race in fourth place. 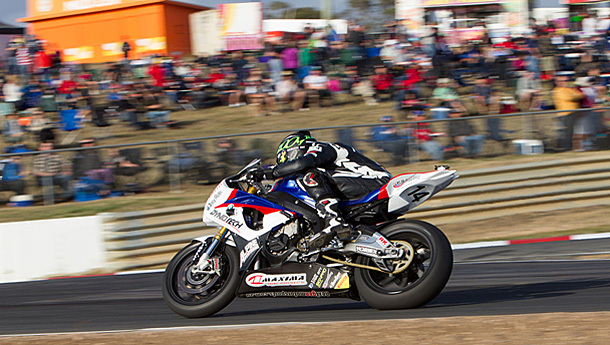 Team-mate and Superbike rookie, Josh Hook finished in fifth place. Race 2 predictably saw those using wet tyres begin strongly and both Stauffer and Hook bided their time until their tyre came in and grip levels allowed them to move through the field. This they did, but with few laps remaining in the race the pair finished fifth and sixth respectively. The 2013 ASBK season was hard fought for Stauffer after a crash in testing early in the year saw him carry a pelvic injury through the remaining four events, however this did nothing to deter him in his efforts to accumulate points. Honda’s Jamie Stauffer – You really have to give this guy a 10! Jamie Stauffer: “This year wasn’t as successful as I hoped going in of course and being injured early on definitely didn’t help, but that’s racing sometimes. We had a bit of a difficult season regardless with a little bad luck here and there and just didn’t quite make our way back. In the Motul Supersport class Daniel Falzon came into the round with a 20-point lead. The South Australian faced stiff opposition from NSW rider Aaron Morris, who won both of tody’s 12 lap races and took the round win. Falzon finished the round third and seven points ahead of Morris in the championship standings. 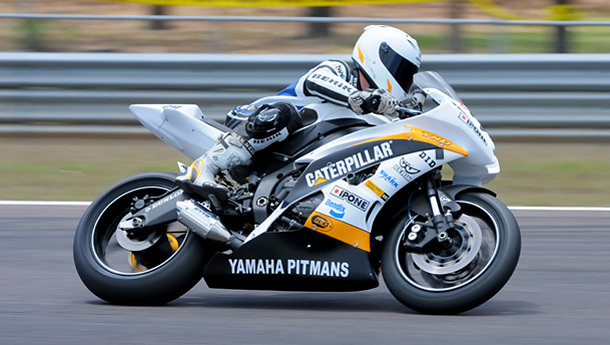 2013 Australian Supersport Champion, Daniel Falzon. “The Motul Supersport Championship has proven to be one of the most the most difficult series I have ever raced in,” Falzon said. “I can’t believe we have come out on top after so much hard work. We stayed consistent all year and I was the only rider to finish on the podium at every round. “It was the consistency that won it for us and I was also extremely lucky to have such an awesome team behind me,” Falzon continued. While Matt Walters secured the Honda Prostock Championship at the previous round the battle for second went down to the wire. NextGen Motorsports Ben Nicholson finished the series in the runner-up spot but it was Sean Condon who came away with the round win today.